maniacalso i'm using m0rehud black, and i've got some missing textures. i am on a new pc, maybe that's the reason why. Looks almost like you are missinge the materials folder, or something is messed up in the clientscheme. Thats the color you get when a texture is missing and the border quik used there has a custom material so check if you have the material folder there first of all. it just get default hud with some diff font. [quote=maniacal]so i'm using m0rehud black, and i've got some missing textures. i am on a new pc, maybe that's the reason why. uh what is the "info.vdf" file, im retarded. pancake_stacksOk, thanks guys. Is there anyway to make the text make the text start from the bottom and go up, opposed to it going down? Maybe use position south? Spelling the word backwards would probably do it efficiently. SkyH4ighuh what is the "info.vdf" file, im retarded. Add this file inside the hud folder, then open it and where it says "TYPE THE NAME OF YOUR HUD FOLDER INSTEAD OF THIS TEXT", type in the name of your hud folder so if it is Evansmorehud you will replace it with that. Add [url=https://www.dropbox.com/s/qc4a2103j1t8nja/info.vdf?dl=0]this file[/url] inside the hud folder, then open it and where it says "TYPE THE NAME OF YOUR HUD FOLDER INSTEAD OF THIS TEXT", type in the name of your hud folder so if it is Evansmorehud you will replace it with that. Anyone knows the name of this hud and if I can find an updated version of it? Hypnotize SkyH4ighuh what is the "info.vdf" file, im retarded. i'm attempting to animate my VTF crosshairs. these are the two PNGs i converted, and i'm willing to reconvert them as TGA if needed. 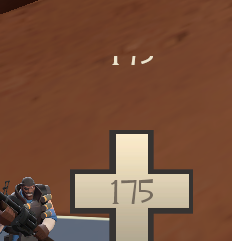 i want the damage dealt crosshair to overlay like it does when it's just uncentered text, if at all possible. [url=https://imgur.com/a/0zVfV]these[/url] are the two PNGs i converted, and i'm willing to reconvert them as TGA if needed. i want the damage dealt crosshair to overlay like it does when it's just [url=https://i.imgur.com/VecflPa.gifv]uncentered text[/url], if at all possible. CAPTURE ALL 5 POINTS TO WIN!! I'm trying to change my health colour in rayshud from white to teal, I've managed it but it reverts every time I die, any suggestions? FinniganI'm trying to change my health colour in rayshud from white to teal, I've managed it but it reverts every time I die, any suggestions? In info.vdf change ui version to 2 should work. I have trouble making HUD crosshair work. previously i edited clientscheme.res to add my custom xhair font, then i add a crosshair element in hudplayerclass.res. I've got hudplayerclass.res from the update and added my crosshair element the same way but it's not showing up. Also, how to get rid of this ugly number? TwiggyAlso, how to get rid of this ugly number? [quote=Twiggy]Also, how to get rid of this ugly number? where do I find gamemenu.res and mainmenuoverride.res? ritawhere do I find gamemenu.res and mainmenuoverride.res? Did the update break the clientscheme in some way? My damage text and item meter labels have all defaulted to white, when they used to be several different colors. hudrocketpack.res. The GitHub diff will help you. hudrocketpack.res. The [url=https://github.com/SteamDatabase/GameTracking-TF2/commit/fc9f52ae9c359fb3735ef703bd3c03a9d63fedb3#diff-408e658d59a51bfe2d3b08c3283f2fe2]GitHub diff[/url] will help you. Attempting to redo menu, how do I get rid of this hover-over box? SevinDid the update break the clientscheme in some way? My damage text and item meter labels have all defaulted to white, when they used to be several different colors. It's probably related to ui_version in info.vdf that you didnt change. It’s a new file, matchmakingdashboard.res. It just clips. Can someone help?